While dining in “resort” areas such as Blue Mountain, I don’t have high hopes for food. Restaurants are never terrible – the high rents won’t allow it – but to meet the “family friendly” requirements, establishments generally veer towards chain-like menu with pizzas, burgers and pasta reining supreme. Hence, I was pleasantly surprised with Tholos. My first visit was years prior, a semi-forced lunch when the resort package we purchase included a $50 voucher to the restaurant. After dining on a selection of appetizers and souvlaki, the experience was tasty enough to warrant a return dinner. 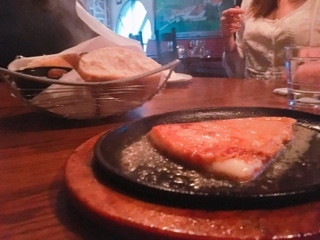 Their menu is still safe, with the westernized Greek favourites like saganaki ($15), a slab of salty chewy kefalograviera cheese, pan fried in a hot pan and then flambéed table side before being finished with a squeeze of lemon. The gooey cheese lets off a fragrant aroma before being tucked into a piece of bread. It’s hard to go wrong with fresh bread and cheese. 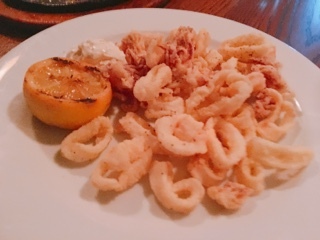 The rings of fried calamari ($16) were too thin for my taste - I find it’s difficult to dip into the thick garlicky tzatziki without the breading coming off. But, it was still decent: lightly floured and tender. 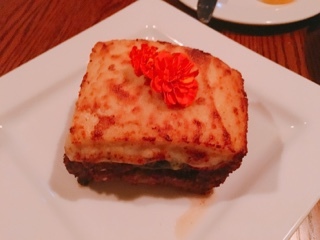 If you’re in the mood for a comforting main, Tholo’s moussaka ($22) is a great choice. Layers of potato and eggplant are combined with a spiced lamb and ground beef mixture before being topped with a cheesy creamy béchamel sauce and baked. Oh it’s good, after sneaking a bite of my friend’s, I instantly wanted more. Luckily, my main didn’t disappoint. 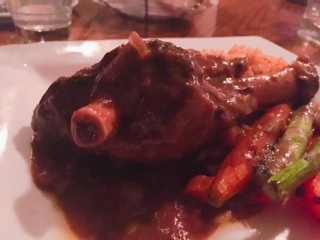 One dish I love from Greek cuisine is braised lamb shank ($27), a large piece of meat slow cooked for hours soaking in the braising liquids with any ligaments turning to a soft gluey texture. Within the side options are tangy lemon potatoes, which sounds delicious, but I had to go with the simpler rice, a much better choice for soaking up the red wine and meat sauce. You don’t want to waste a drop of this. 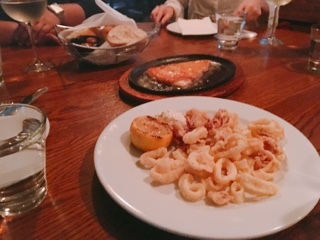 Sure, Tholos still has elements that draw in families – such as the re-creation of a courtyard setting that aims to make diners feel like they’re eating in ancient Greece; or pasta, burgers and chicken fingers to appease finicky eaters. Yet, for us adults, Tholos offers decent appetizers and delicious mains … and the selection of $45 bottles of wine makes for a jovial night, courtyard or no courtyard.